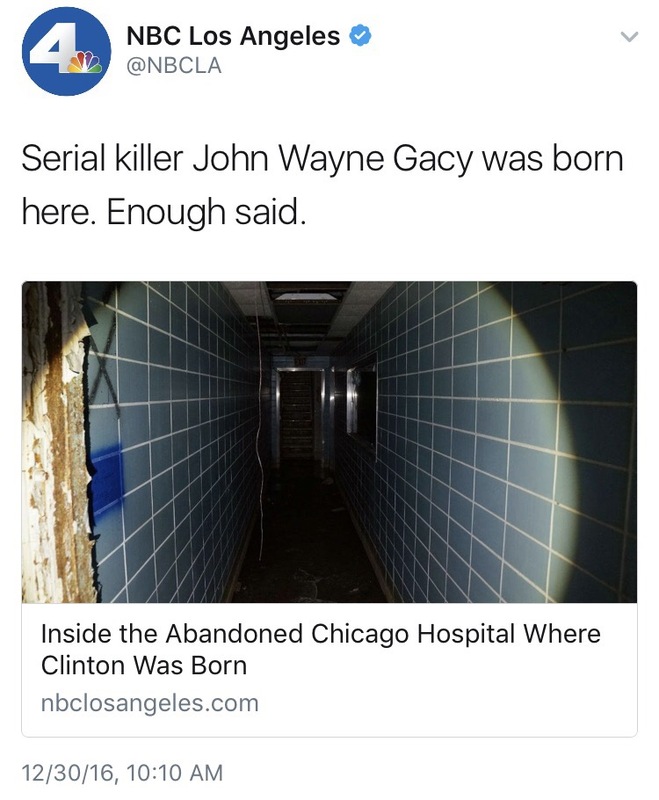 NBC4, the NBCUniversal owned-and-operated affiliate station in Southern California, tweeted out a link to a story titled, “Photos Show Inside Creepy Abandoned Edgewater Hospital.” When the news organization went to tweet the story, the picture had a caption of “Inside the Abandoned Chicago Hospital Clinton Was Born.” Hillary Clinton was born in the hospital. However, the accompanying tweet was, “Serial killer John Wayne Gacy was born here. Enough said.” Gacy assaulted and murdered over thirty males during the 1970s. The tweet was criticized for seeming to connect Clinton and Gacy and their actions.